During this time of year you might be asking yourself why the hell did I plant so much zucchini? Or do I really need so much damn squash? I hear you. You notice friends and coworkers have begun avoiding you so you can’t give them any more vegetables. I feel your pain. 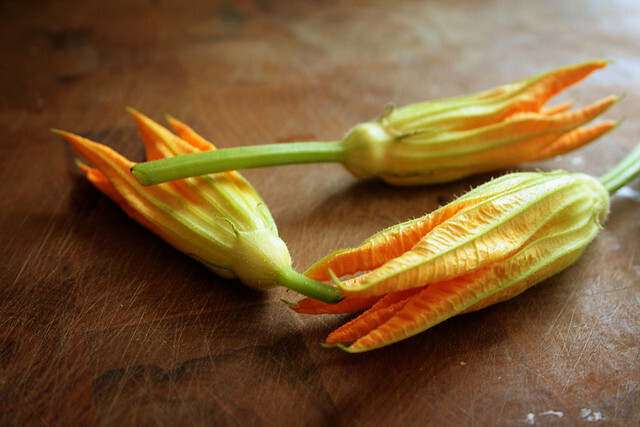 Or did, until I realized that squash and zucchini blossoms are not only edible, but are tender and more delicious than the squash themselves. 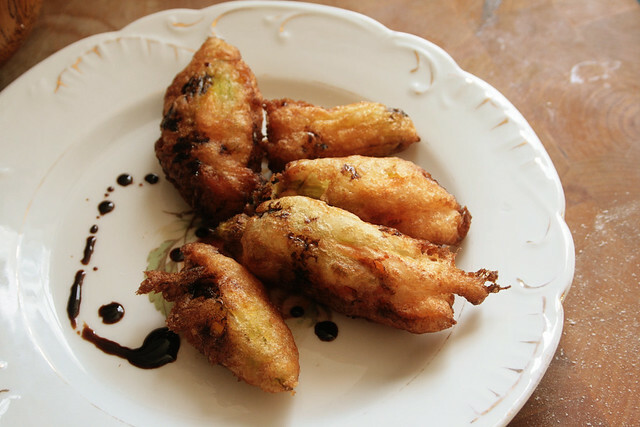 It’s not common to eat fried squash blossoms here, but in other parts of the world, like Italy and Mexico, squash blossoms are incorporated in everything from risottos to tacos. 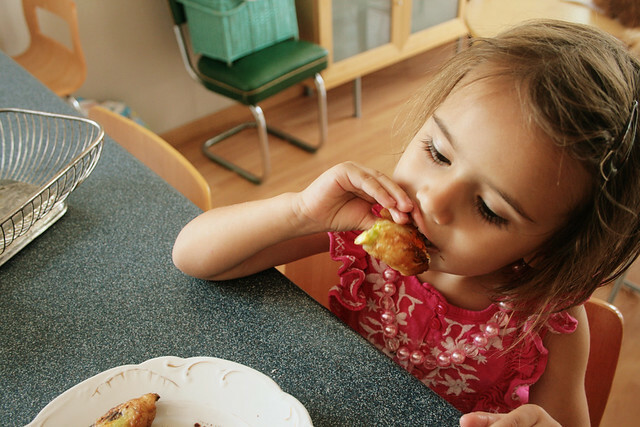 In fact, one Little Big reader has sent me a recipe for squash blossom risotto that came from her Italian aunt, and I’m giddy at the thought of trying it. 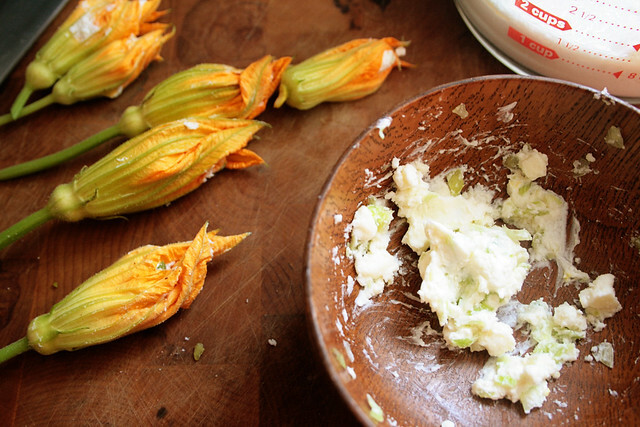 I’ve used this recipe with both zucchini blossoms I found at the farmer’s market, and these smaller, more delicate buds that came from my friend Jacob’s garden. Both are fabulous, but you’ll have to watch the smaller buds carefully as they fry almost instantly and can quickly burn. A note on squash blossoms: the squash plant isn’t a self-pollinator, meaning it has both male and female flowers and it relies on bees do to the dirty work of fertilizing their crop. Female flowers have a diminutive squash beneath their petals, and if their flower is fertilized it will turn into a squash. After the male flower has contributed his pollen, his role is done. It is often these flowers, the male flowers, that you’ll find in the market because farmers will leave their female flowers to squash-makin.’ Both sexes of flowers are edible, and I think the female flowers are delicious. (You can even see one, with a tiny squash attached, in the photo below.) Male flowers contain a stamen in the middle, and it is quite edible but I prefer to remove those first. Sometimes they taste slightly bitter and they always make stuffing the blossom harder. It’s no big deal to leave the stamen in tact, however. Here’s a handy guide on telling male and female flowers apart on the vine. Here’s a basic squash anatomy lesson. 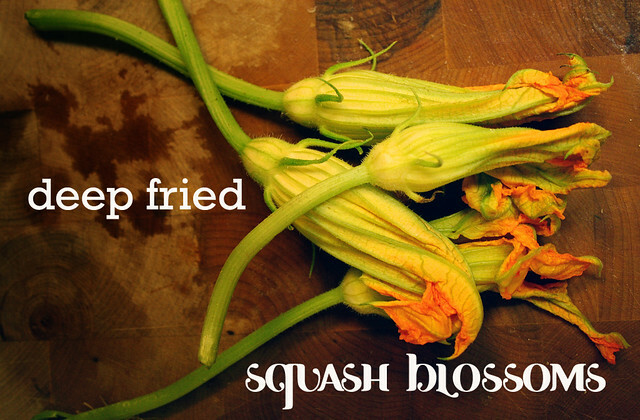 Squash blossoms can be stored in the fridge until ready to use, but I wouldn’t keep them waiting too long. – Heat your oil in a large, heavy-bottomed pan. 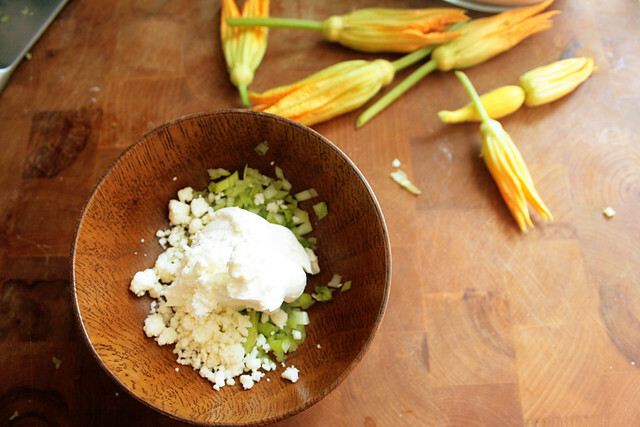 The oil will be ready for frying when it reaches 375 F.
– Mix the cream cheese, feta, and scallions into a paste. 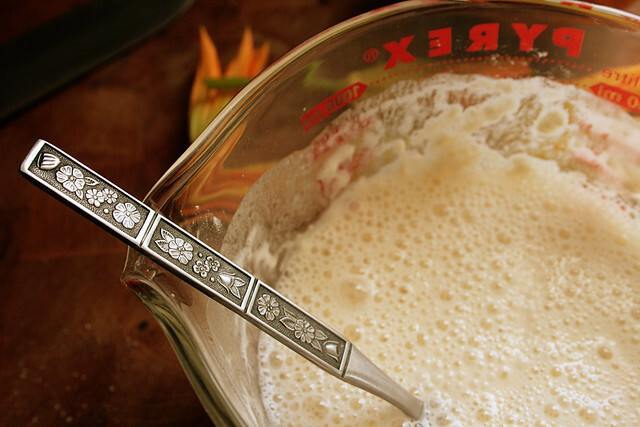 – Add the flour and salt to the club soda and stir to combine. 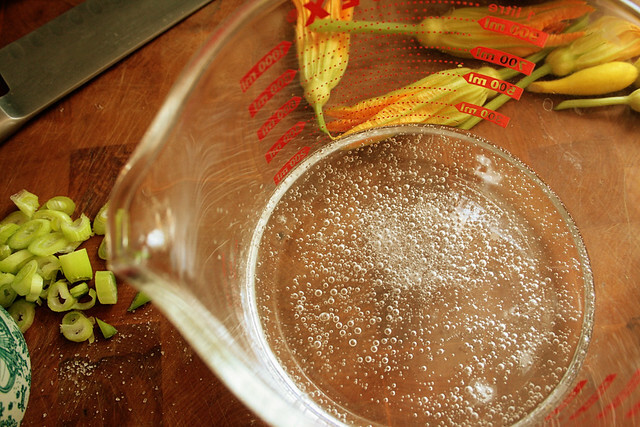 – Stuff the squash blossoms with the cheese mixture. Go slowly and carefully, as it’s easy to tear the delicate petals. I’ve heard of people piping the cheese mixture in with a pastry bag, and that sounds like a good idea, but it’s not necessary. I used my fingers. After the blossoms were full I twisted the tops of the petals together to seal. 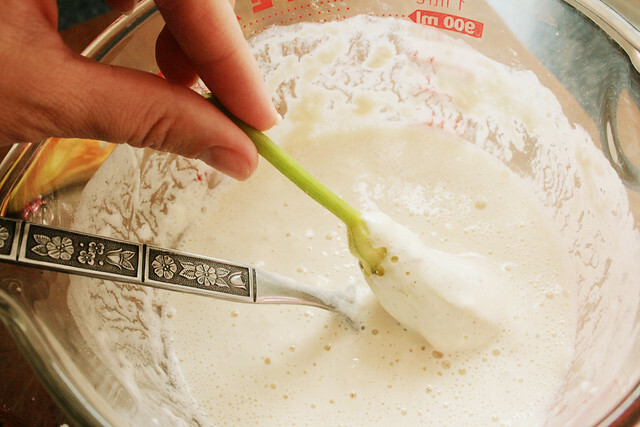 – One at a time, dunk blossoms in the batter and fry, watching each blossom carefully. These tender babies were only in the oil maybe ten seconds before they were cooked to perfection. I couldn’t fry them as a batch, though, I had to do them individually and watch them carefully. 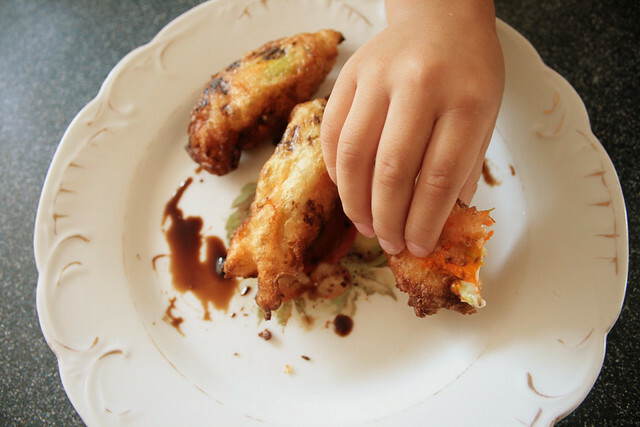 I served these with a drizzle of good balsamic vinegar and Isobel ate these up like candy. CANDY, I tell you! When she was done she kept looking for more squash blossoms and she even licked the vinegar off the plate. Next year I think we’ll grow zucchini–for the blossoms. OMFN. That was my plan this year but with the heat wave and drought up in these parts, it’s been a rough gardening year. Sadly, I haven’t gotten any blossoms on my squash. I did get a couple pumpkin blossoms, but it didn’t seem worth the effort to do them one at a time. It would be a lot of work, plus a big mess, to do them one at a time so I don’t blame you. Maybe next year!